Fenerbahce Ulker Istanbul controlled the game for 40 minutes in defeating JSF Nanterre 76-95 to claim first place in Group A, while eliminating Nanterre in the process. Fenerbahce finished the regular season with its best-ever record, 8-2, while Nanterre ended it Euroleague debut with a 3-7 record and fifth place. 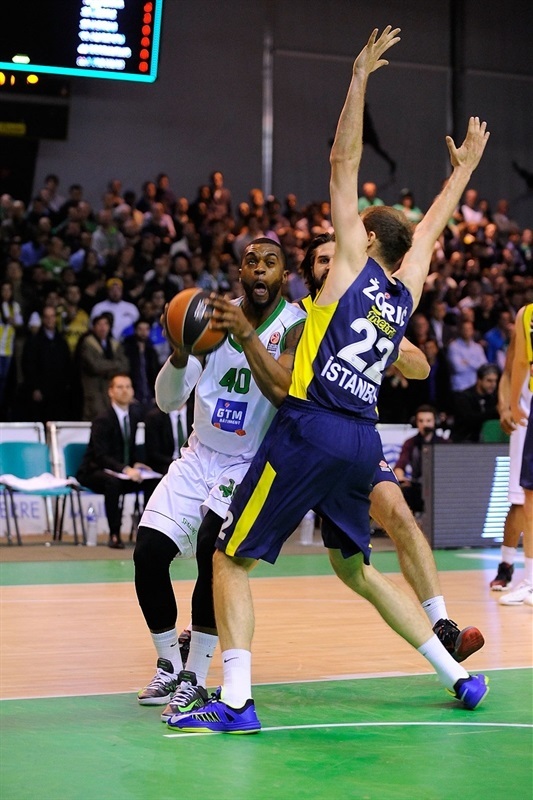 Fenerbahce took the lead for good in the first quarter, before extended the margin to the double digits in the second. After holding a 41-51 halftime advantage, the visitors never looked back in the second half and Nanterre did not come closer than 9 points the rest of the way. 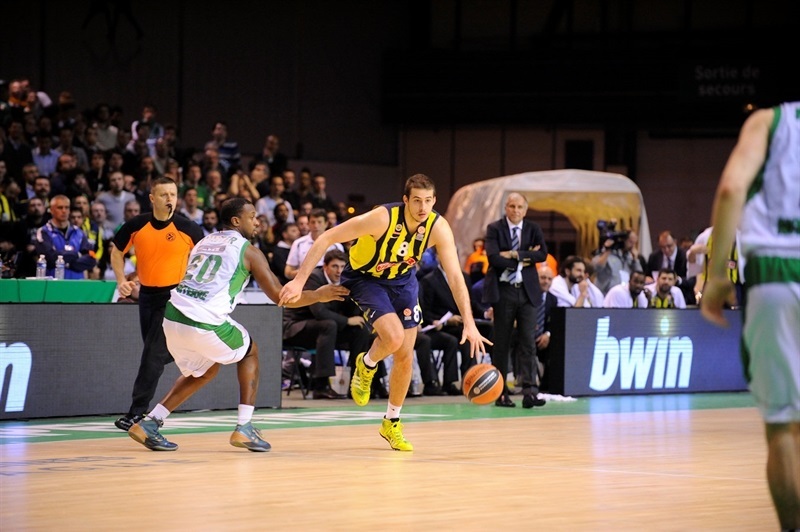 Turkish Airlines Euroleague leading scorer Bojan Bogdanovic paced the winners with 20 points. Luka Zoric and Bo McCalebb scored 14 apiece, while Linas Kleiza contributed with 11 and Nemanja Bjelica 10 points in victory. 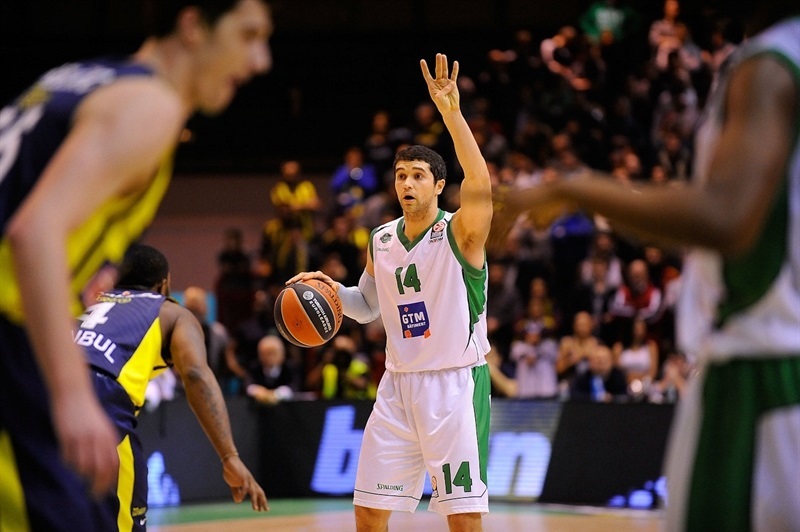 For Nanterre, DeShaun Thomas netted 14, David Lighty 11, and Trent Meacham 10 in defeat. 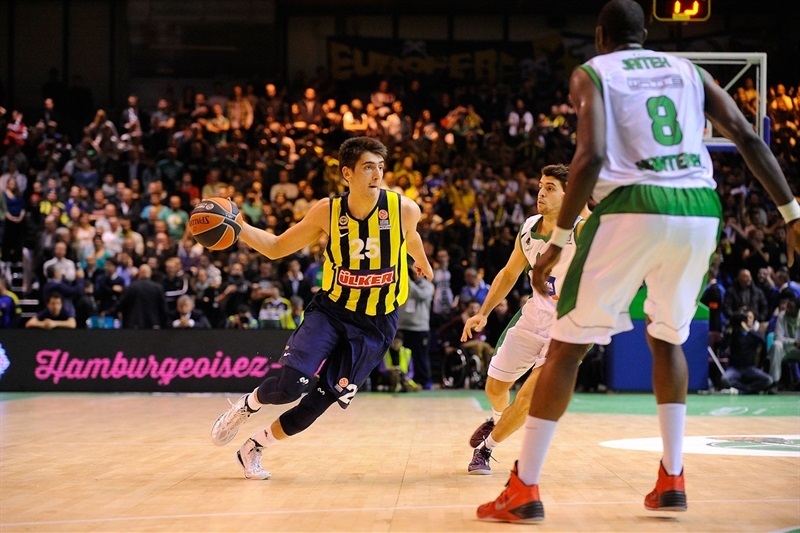 Gasper Vidmar needed just one offense to slam it down and prove Fenerbahce was taking the game very seriously. The home team didn’t get scared though, and managed to take an early 3-2 lead behind free throws by Johan Massave and Meacham. The defensive effort by both sides was huge, preventing the game from getting into a high-scoring rhythm. McCalebb took over for the visitors, scoring a couple of free throws and finishing a fast-break to put the visitors in charge 3-6 after three minutes. Passave and Zoric exchanged inside baskets then, before Will Daniels joined the show too to make it 9-8 with back-to-back bank shots in the paint. Zoric and Kleiza struck back for a 9-12 Fenerbahce lead, right before the home team called for a time out midway through the first quarter. Kleiza kept hitting from the line to make it a 5-point game, but ended up tipping the ball into his own basket in the following play. Kleiza seemed not affected though, as he scored again –this time in the right place – followed by Zoric to set it at 11-18 with three minutes to go. Thomas answered with a fastbreak dunk, followed by a short jumper by Ali Traore that awoke the French fans. McCalebb and Thomas exchanged threes after that, while Nemanja Bjelica added free throws to keep Fenerbahce in good position. Lighty showed up with a big three to reduce the gap to just 2 points, 21-23, entering the last minute, but Bogdanovic took advantage of his size to make a jumper first, and hit a one-legged bank shot later, to close the quarter with Fenerbahce leading 21-27. Bogdanovic kept rocking in the beginning of the second quarter, banking another shot over his defender to extend the advantage to 8 points. Meacham answered with a tough off-the-dribble jumper, but Fenerbahce looked comfortable in offense, and found no problem to find easy points by Zoric and McCalebb inside. Traore tried to boost his team up, but Bogdanovic scored again to make it a 10-point game. Melih Mahmatoglu made it even worse for the home team with a three on his first attempt, but Thomas replied on the next offense to avoid an early escape by the visitors. Foster and Mahmatoglu exchanged layups, as the difference remained stable for a while. 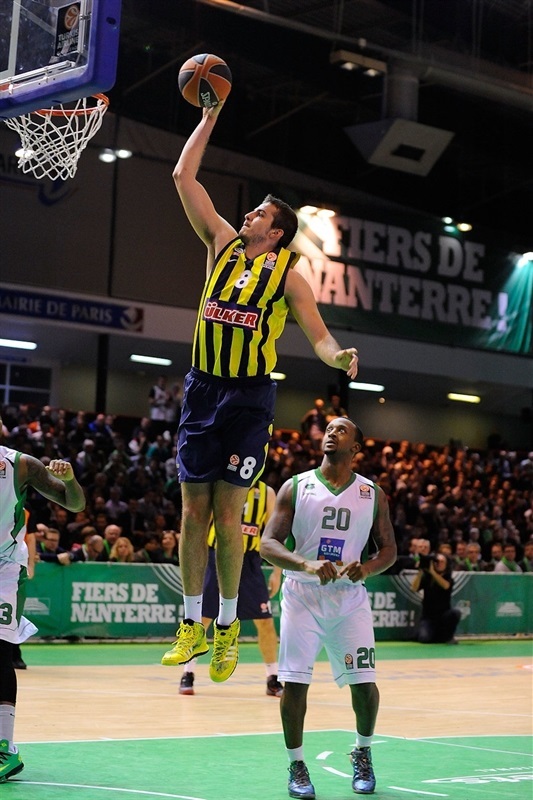 Bjelica came up big with a monster dunk, while Fenerbahce’s defense started to work much better. Meacham found a lucky banked three-point shot to reduce the margin to 33-42 with four4 minutes to go in the half, but Nanterre couldn’t go further. Bjelica took advantage of his quickness and size to draw fouls and hit free throws, enough for Fenerbahce to keep a safe double-digit margin, 35-45. Nanterre tried to change the trend with a timeout, but the difference remained the same despite the efforts of Lighty and Passave. A couple of free throws by the French forward closed the half with the home team trailing 41-51. Omer Onan hit a long jumper right after the break, quickly answered by a three pointer by Daniels. Both teams tried to find points from long distance, as McCalebb and Meacham exchanged triples of their own to set it at 47-56. Preldzic was the first one to break the trend with a couple of free throws, followed by an inside basket by Kleiza. Marc Judith capped a steal with a fastbreak layup, but Kleiza remained hot and hit another three to raise the difference to 14 points. 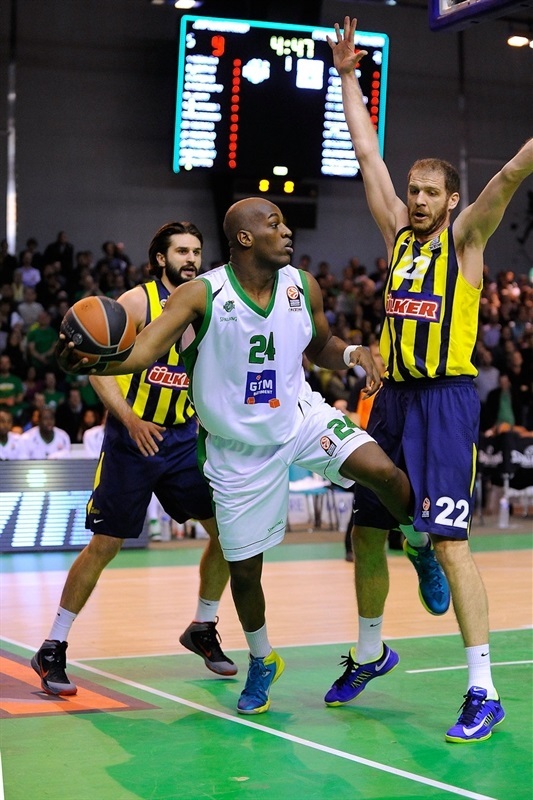 Fenerbahce managed to retain that margin with no big trouble, despite the effort Nanterre was putting on the floor. Thomas and Lighty came to the rescue and reduced the margin again to 55-65, but Zoric denied any reaction with another basket under the rim. Nanterre also struggled from the free throw line, which prevented them from building a serious comeback. Bjelica pumped the difference to 14 points from the line, as Nanterre was unable to find easy shots and survived thanks to off-the-steal fastbreaks. The visitors weren’t excellent in offense at that point, either, but managed to keep the scoring rhythm from the free throw. Lighty and Jekel Foster missed a couple of threes that might have changed the game, and even though Thomas tried to fix it with a nice penetration to keep his team alive, 59-71, Vidmar tipped-in a shot at the buzzer to return the 14-point lead, 59-73, to the visitors at the end of the quarter. Nanterre tried to find solutions through a zone-defense early in the fourth. This weapon was good to slow down Fenerbahce’s offense, as the visitors added just 2 points from Vidmar in the first three minutes. It was Bogadnovic, with a corner three, to open the door for the visitors, setting a game-high 15-points margin. 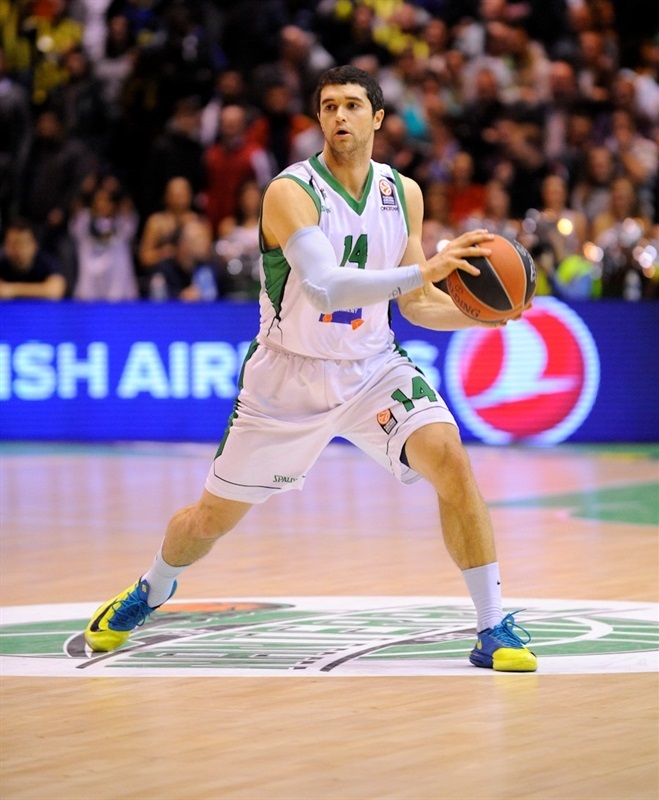 Nanterre kept struggling on offense, unable to find easy baskets. Lighty and Foster tried, but most of their points had to come from one-on-one situations. Fenerbahce entered the last five minutes with a comfortable lead, 67-82, and showing great confidence, while Nanterre started to fade away step by step, seeing how the Top 16 dream was far away from their reach. Zoric made it a 19-point game with a couple of free throws, as Traore said goodbye to the regular season after being fouling out. With the outcome in no risk, Fenerbahce just needed to let the clock run down and look for good ball circulation to maintain the difference and win the game. Despite the result, the French fans didn’t stop cheering and supporting the home team, which finished just one game short of qualifying to the Top 16 in its Turkish Airlines Euroleague debut. A buzzer beater basket by Miguel Cardoso closed the game with a final score of 76-95. "We leave the competition proud, we cannot have regrets on this game, there is a big difference between Fenerbahce and us. I think we can still be proud, we were promised hell on and off the court in this Euroleague, but I think we lived up to the challenge and are out only by the point average. We probably suffered the pressure last week in Kiev and that’s where we lost the qualification. 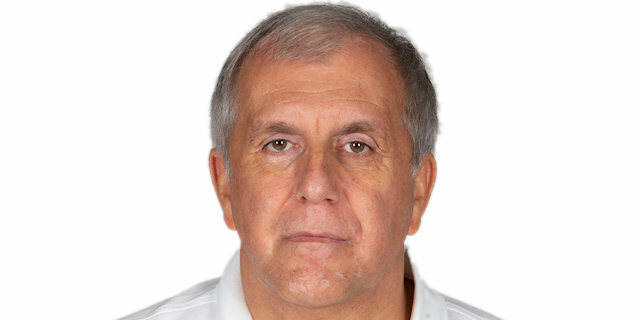 But how to have regrets, especially after losing Gladyr, but Partizan lost Westerman also, injuries are part of the rules. As a club, our position is not in the Top 16. 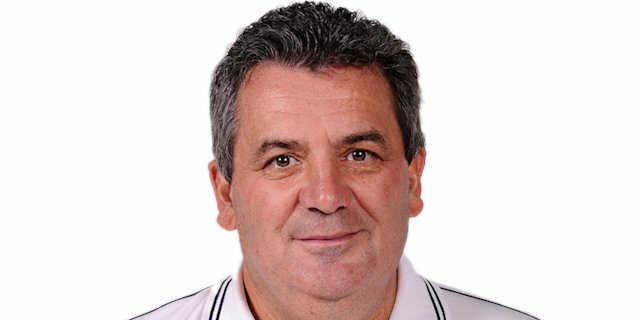 With enthusiasm, some luck, and great efforts, we could have maybe done it, but if we did qualify, I would have been the happiest coach in the world, but also the most worried, because we don’t have the roster to compete in Top 16. Eurocup is a great competition, we are lucky this season to be able to pursue the opportunity of playing Eurocup, and it’s also going to be a difficult challenge." "We came focused to keep our first place. Top 16 is a different competition so we will see what we can achieve in the second phase. I believe this game was a nice game for the fans who attended, played in a nice atmosphere. We are a new team and we had no preparation because of many players being on national teams. The Top 16 will be difficult for everybody. There is no easy game in Euroleague. About our game last week, it’s just basketball, we respect everybody, one day you play good and one day you play less good, that’s basketball."